My husband and I tried something today with our ratties (it is hot and muggy in the Seattle area right now) and I kind of feel like an idiot for not thinking of this before, but normally we do all the things like oscillating fans, frozen water bottles, fishing for peas, etc. but today I got out a couple of washcloths and soaked them with cold water, wrung them out and we just sort of draped them over each of our boys with just their heads peeking out and sort of softly rubbed the cloths over their bodies and swiped down their warm tails, and they LOVED IT. Even when we took our hand away, one of our boys just laid there with his washcloth draped over his body and the look on his face was so sleepy eyed and euphoric looking, he just chilled out like that for several minutes, then groomed his moist fur and did a face scrub. Our other boy walked out from under his washcloth and plopped right down on top of it to cool his belly. Maybe lots of ratty people do this all the time? It worked very nicely for our boys! You will always be with me, my sweet boys. I will see you at the Bridge. Their reactions have me giggling out loud. Such silly stinkers. I've never seen my rat do this, but the first thing I though of was our lowbody bassador dog laying on her back over the air vent, and then flopping over, levering herself up with a groan, walking in a circle and dropping back down with her belly over the vent with a grunt and a siiiiiiiigh. Ha ha, exactly! That is adorable. Why did I never think of a cold moist washcloth draped over my bubs when it is hot? I have no idea. 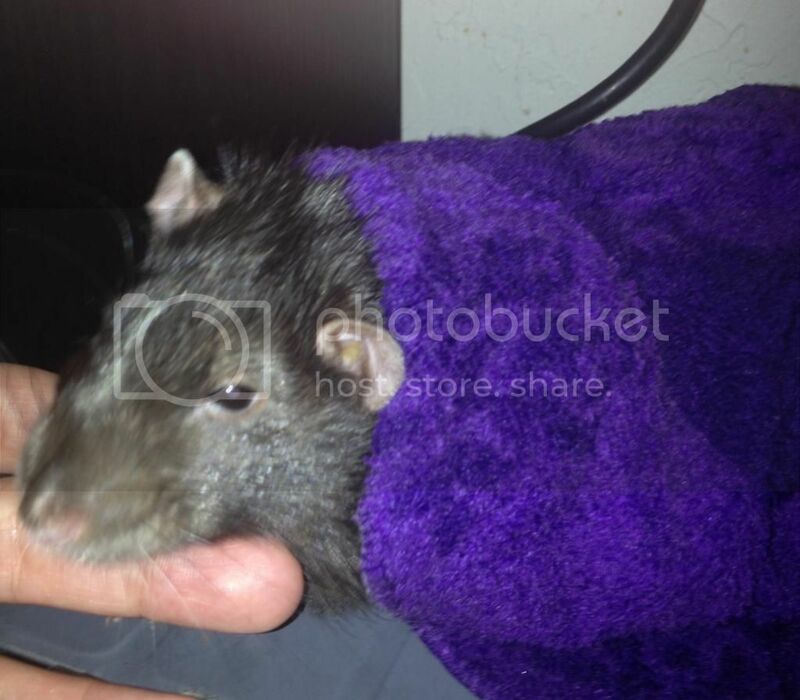 We do all the other neat stuff to keep them cool that I have seen others mention on rat forums, but I can't believe I never thought of the cold washcloth for heat wave days. By the way, I love your new photos on your signature of your three new kiddos...great pictures! Waddel already has that big beefy boy look in his chest and neck. He is going to be such a manly squishy boy! And...Luster has the SAME look in his eyes that Maximus has...sort of that, "I'm on the alert and slightly concerned and ready to zip out of here." And...Clara's signature photo? Holy cow, she just has Adorable Sweet Lady on her face. Just a DOLL! Look at that smile!! What a pretty little girl she is! Last edited by Vladina; 07-02-2013 at 08:02 AM. I'm wondering if you could put the washcloth in a freezer for 20 minutes and just lay it nearby, what they'd think of that? Hey, I think that would be a great idea! Especially since I noticed that Maxie preferred actually laying his belly right on top of the washcloth, rather than underneath it like Achilles enjoyed. A frozen washcloth would give off such nice icy instant air conditioning if you will. That would be a great thing to try! I will try it! Hey, one of the few photos Marc took of Achilles under his washcloth actually came out semi okay. Here is the big boy enjoying his cold moist washcloth blankie...I think if he could have sighed with delight out loud, he would have! He stayed like this for awhile, just chillin' out under his nice cold washcloth, loving every second of it. Wish we had snagged the first shot of him when just his little nose was sticking out, but he wanted chin scritches from Daddy so he stuck his head out a bit for some finger lovin'. Sorry the photo is too durned big!! Yes, I know, it amazes me! Especially when you look at your big boys and compare them to their baby pictures. I cannot believe they were ever so small! Informative. My gerbils was having trouble with the weather changes. I took them to a vet last day.